Special New Year’s Day Hours—Join us as we try something new! This year, we’ll be open from 9—2 on Friday, Jan. 1st – New Year’s Day – and 10—4 on Saturday & Sunday. 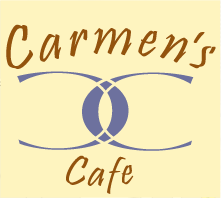 We will have some amazing specials, like Orange Pecan Pancakes, Carmen’s Hearty Chicken Soup. From then it’s on to the new year, and, unlike other times, we are staying open all winter. That’s right, you heard it here first: Carmen’s all winter long, for your brunching pleasure: 9—4 Saturdays and Sundays, with tasty food cooked fresh, and some of the finest specials you’ve ever tucked in to. This entry was posted in Cuban Cuisine, Special Events, Upcoming Events and tagged capital district, Cuban food, Latin, New Year's Day, Troy. Bookmark the permalink. Thank you for that sumptuous Christmas Eve pot luck! My first time at this event and being alone, I was warmly welcomed! I just love the feeling of family and the always warm welcome when I visit. You are one of my most favorite places to visit! Happy New Year to you, your family and your staff!